Former Defense Minister announces run for Knesset in April elections calls for new leadership to "bring hope to Israel." 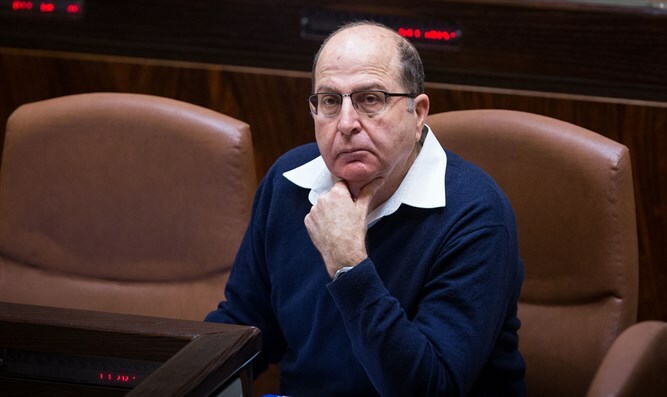 Former Defense Minister Moshe Ya'alon announced on Tuesday that he would set up a new political party to run in the upcoming Knesset elections in April. "I promised and I'm keeping it," Ya'alon said. "I'm going to head a party, it's our time to take responsibility." He promised to publish a list of candidates for his list in the near future. "All my life I was a soldier of the state. I call upon you to enter with me under this banner and bring hope to Israel. It's time for different leadership," added the former defense minister. "I also call for a combination of forces and a combination of forces in order to put an alternative to the leadership of the state and act to promote it." Yesterday, the leaders of the coalition voted unanimously to dissolve the current coalition and to hold early elections on April 9. Ya'alon served as Defense Minister from 2013 until he was replaced by Yisrael Beiteinu leader Avigdor Liberman in 2016. His relationship with Prime Minister Netanyahu has deteriorated since he was forced to leave his ministerial position.